Wedding corsages are created from a single or small group of flowers and are worn by the female members of the wedding party. It is similar to a male boutonniere but is usually slightly larger. The mothers of the bride and groom normally wear corsages. It is also a good idea to include the grandmothers as well. Check with them what their outfits are going to be so that appropriate flowers can be chosen for the corsage. 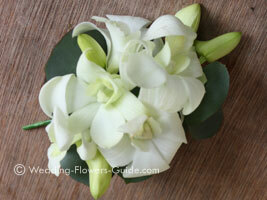 Singapore orchids (Dendrobium), stephanotis, roses and gardenias all make good corsages. A pink rose formed the main flower in the photo above. If you want a uniform look to your wedding and to provide a symbol of unity between the two families, why not co-ordinate your corsages with the gents' boutonnieres? You could choose a white rose such as 'Akito' or 'Bianca' as this will complement most people's clothing. Corsages will usually come from the florist with a corsage pin. This is a pearl-headed pin that is pushed through from the back of the garment, through the corsage, and back through the garment. Recently corsage magnets have become available. These are for delicate fabrics where you wouldn't want to put a pin through. A small magnet is incorporated at the back of the corsage design and a thin metallic disc is placed on the back of the garment that secures it in place. We supply our corsages with both magnets and pins so that the recipient can have the choice of how to wear their corsage. The photo above is one of our Singapore orchid lapel corsages made with a magnet on the back. I like using orchids as the flowers are very light and lay flat on the jacket. Wrist corsages can look very stylish with a short sleeve dress. They are a great alternative if the ladies are not wearing a jacket and their dresses are not suitable for a lapel corsage. Wrist corsages have the advantage over a bouquet that both of your hands are free. 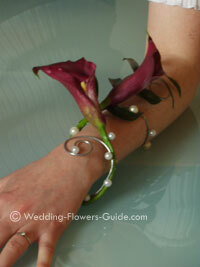 We have made wrist corsages for bridesmaids as an alternative to holding a bouquet. This is a good choice if the bridesmaid needs her hands free to carry the trail of the bride's wedding dress. They also use less flowers than a bouquet so can make a good alternative if you are on a tight budget. 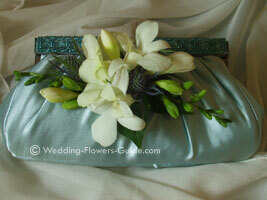 Sometimes we are asked to make a handbag corsage because the guest wants to protect their clothes. These are created in a similar way to a normal corsage. It is best attached to a rigid part of the handbag, either the handle or the main part of the bag itself, like the one shown here. I created this using Singapore orchids and blue thistle. Another idea for wearing a corsage is to create one for a hat. These can be easily attached using a pin or magnets depending on the material from which the hat is made. For the latest ideas on bridal bouquets, wedding corsages, centerpieces and arrangements, subscribe to our FREE newsletter here.